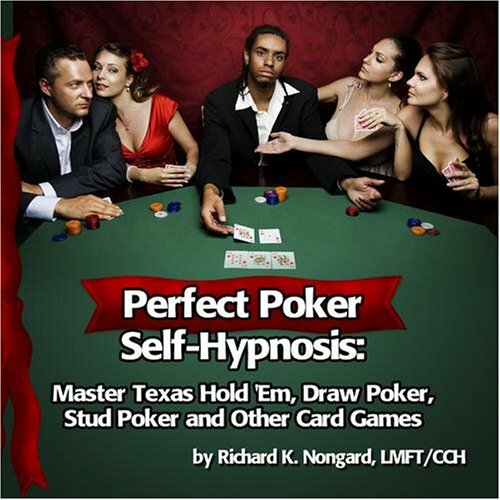 Perfect Poker Self-Hypnosis: Master Texas Hold 'Em, Draw Poker, Stud Poker and other Card Games The face contains over 200 micro-muscles, and throughout our lives we have subconsciously learned to express ourselves with the body, and these "tells" must be mastered to develop the perfect poker face. Hypnosis can help you master the game of cards by teaching you skills for mastering non-verbal communication, manage emotions and create a winning attitude that attracts wealth and good fortune. Poker is a game of skill and mastery of the game is dependent on you. This CD can help. The underlying music track with the sounds of nature and embedded binaural beat technology will help you to enjoy this self-hypnosis session and experience deep levels of relaxation and powerful new learnings. Richard K Nongard, is a Certified Clinical Hypnotherapist and a Master Stage Hypnotist who lives in Las Vegas and has performed on the Strip. He understands the psychology of card playing, and you will enjoy his educational hypnosis style that will teach you to master the game of poker using the techniques of hypnosis and brainwave entrainment technology.